In the United States, decreasing demand for coal has contributed to lower coal production, which has fallen by more than one-third since peak production in 2008. 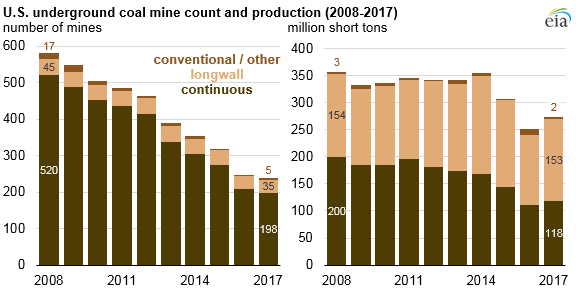 As U.S. coal demand has declined, the number of active coal mines has decreased by more than half, from 1,435 mines in 2008 to 671 mines in 2017. As the U.S. market contracted, smaller, less efficient mines were the first to close, and most of the mine closures were in the Appalachian region. Although underground mines had a larger percentage of closures from 2008 to 2017 (60% versus 49% of surface mines), surface mines have seen larger declines in production, falling 39% compared with 24% for underground mines. 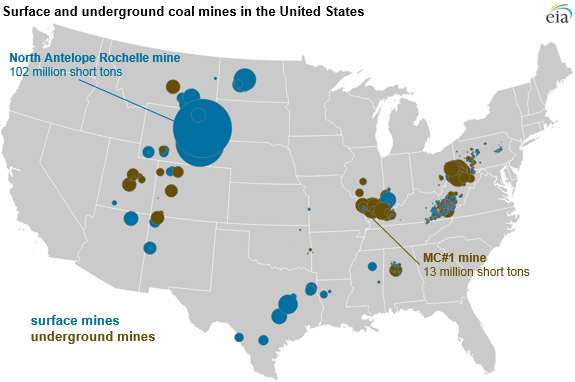 Most coal regions contain a mix of both surface and underground mines, except for the Powder River Basin in southeast Montana and northeast Wyoming, where large surface mines account for more than 40% of total U.S. production. The Appalachian and Illinois Basins east of the Mississippi River have the most mines in the country, with more than 77% of eastern production coming from underground mines. Between 2008 and 2017, 340 fewer underground mines produced coal in this region, compared with 410 fewer surface mines. In contrast, basins in the west—primarily the Powder River Basin—have fewer mines, and production mainly comes from a smaller number of large surface mines. The uptick in mine closures since 2008 has largely been driven by economics, and smaller, less profitable mines have been more susceptible to closures. Several factors dictate the profitability of mines, including the method used to extract the coal. Underground mining uses three different methods: longwall, continuous, and conventional. Longwall mining uses an automated cutting machine, and the broken coal is transported to the surface on a conveyor system. Roof supports are moved as the machine advances, allowing the roof to fall once an area is mined out. Longwall mining has high recovery and extraction rates and is the most productive type of underground mining, but it can only be used in flat, thick, and uniform coalbeds. Continuous mining is a form of mining called room and pillar mining, in which a continuous mining machine extracts and removes coal from the working face in one step with no blasting required. Pillars of coal are left to support the roof between areas where coal is mined. Conventional mining is a form of room and pillar mining that consists of three steps: cutting the coal, blasting the coal, and then loading the broken coal. This category also includes other miscellaneous mining methods, such as shortwall, scoop loading, and hand loading. Surface mining techniques are categorized as either strip, open pit, or mountaintop removal. Strip mining is a method used on flat terrain and involves removing soil or rock above a layer of coal, exposing the coal seam for mining. One type of strip mining is contour mining, where extraction activities occur on a hillside. Another method, area mining, occurs on relatively flat terrain. Contour strip mining accounted for more than half of the surface mine closures between 2008 and 2017. Open-pit coal mining is a combination of contour and area mining methods and is used to mine thick, steeply inclined coalbeds. In contrast to other forms of mining, open pit mines increased in number from 2008 to 2017, but production levels still fell. Mountaintop mining is sometimes considered a variation of contour mining and involves removing the mountaintop, or the overburden (rock or soil overlying a mineral deposit), which creates a level plateau or gently rolling contour and exposes entire coal seams running through the upper portion of a mountain. Mountaintop mines are relatively few in number compared with contour strip, open pit, and area mines. Production levels at mountaintop mines are similarly small. Other surface mining methods account for very small shares of coal production. Although the number of mines using these methods are nearly as numerous as the combination of area and open mines, production remains small.